The image of the dove carrying an olive branch is an iconic symbol of peace and love. 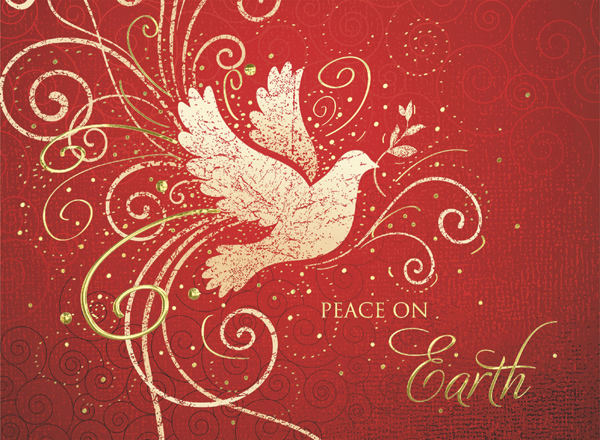 This card is perfect if you wish to convey the message of peace this Christmas. Decorated with a wealth of gold foil dots and swirls, the inscription 'Peace on Earth' is also printed with gold foil, to complement. A simply gorgeous card for you to personalise this Christmas. By purchasing the The Art of Peace Christmas card 10p for each card you purchase will be Donated to the Charity of your choice from the Charities listed below.